Not withstanding what I have just said, I like to look around the shops when the new collections arrive, to draw up a wish list (if my bank manager is reading this – of course I mean a totally fantasy list) of items to buy. So far the items I spied that I would love to find in my closet this Autumn, include a beautiful red wool crêpe dress by Roksanda Ilinic (it looks very much like the purple dress Michelle Obama wore in London recently to see a photo click here), dark denim J Brand jeans, leopard print ballet flats from the Jimmy Choo 24:7 collection, and any one of various pairs of beautiful flat leather boots I have seen by an assortment of designers at stratospheric prices. It’s unlikely I will buy any of these but it’s nice to dream. 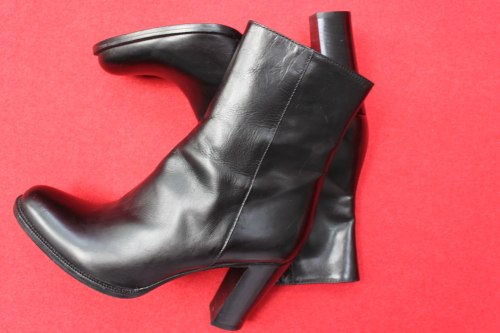 However sometime in a vague distant financially plentiful future, I would like to invest in a decent pair of leather flat boots; so in the interest of research I had a look on the Net a Porter website. While I was browsing I saw a pair of Christian Louboutin ankle boots (Miss Tack), not I admit exactly flat (100mm/4 inch heels) however what really drew my eye to the Louboutin boots, was an uncanny similarity to a pair that I already own, mine (by Colisée de Sasha) don’t of course have red soles but there is more than a passing resemblance. I have taken my boots out from their dark hiding place and lined them up, ready to wear as soon as opaque-tights-wearing-suitable-weather returns. Shamefully I have only worn them a few times since I bought them in a sale, in I think 2007! Thankfully in the boot’s case, I didn’t adhere to the closet-clearing maxim of getting rid of anything you haven’t worn for a year. I have decided to delve further into my closet,to see what else could be worn this winter; maybe a garment I have forgotten about or something that could be recalled to sartorial duty with a little updating. Do you shop your closet?